Issue 1 of this series was a great book, with plenty of characters all given enough to do and great art work to top it all off. While this issue manages to continue achieve the something different that it set out to do but for some reason the issue falls short. Not featuring heavily in the first issue, Black Panther takes centre stage and has a conversation with Galactus about the threat he poses and Galactus not listening to him - after all Black Panther is nothing more than an ant to a planet eating monster so then the but-kicking starts. 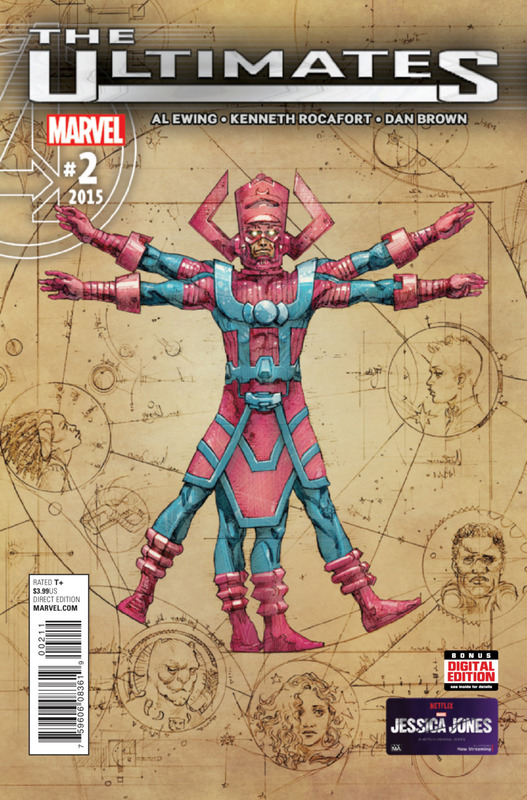 If you are not a Galactus fan then it is hard to understand this character. On the surface is a purple giant man who eats planets to satisfy his never ending hunger. Author Al Ewing reinvents the origin to fit in with the storyline and makes more sense so it fits in with the story. Now Galan's origin is less cosmic egg and now the origin story makes sense for new readers. I think the downside of this issue is that it has a tendency to be a bit chaotic and we don't really get to see how all the characters are going to fit into it. 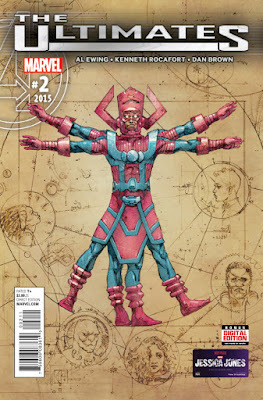 Aside from Black Panther and Galactus, all the other characters are pushed aside and don't get a lot to do even though they're a part of the story. While Ewing's story is a great driving force for this series but it is really down to the beautiful art from Kenneth Rocafort that really gives this series a cinematic feel. Dan Brown's colouring is highly distinctive and makes the characters really stand out on the page. The page designs are really interesting with the different panels which have interesting colours that are non-traditional and when the action in these pages become chaotic so do the panels and borders and it becomes the perfect way of enhancing the tone and action within these pages. Overall this a good second issue. Perhaps not as strong as the first issue, the writing continues being some of the best I've ever read, even if the issue really focuses around two characters that aren't all that interesting. Perhaps the best thing about this issue and indeed the series so far, is the art which really elevates this series to a whole new ultimate level.